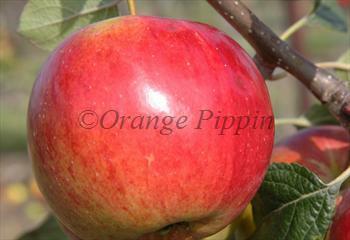 Many growers have attempted to combine the superb flavour of Cox's Orange Pippin with other varieties that are less disease-prone and easier to grow. Fortune, developed by the Laxton Brothers Nursery in the early 20th century is a good example of this, having some of the aromatic richness of Cox but much better resistance to the apple disease scab. Although not as well known as Laxton's Superb, it remains a popular garden apple variety. Please fill in the details below and we will let you know when Laxton's Fortune apple trees are back in stock. Laxton's Fortune is in flowering group 3. Laxton's Fortune is partially self-fertile, but fruiting will be improved if there is a compatible tree of a different variety nearby. Since it flowers in the middle of the blossom season it can be pollinated by most other apple trees. If you want to learn about biennial bearing in apple trees, Laxton's Fortune is the example the textbooks usually mention! Biennial bearing is when the tree fruits heavily in alternate years, with a light crop or no crop in the intervening year. Heavy-cropping varieties which are also of low vigour - such as Laxton's Fortune - are most prone to this condition. To prevent this happening, make sure you don't let the tree set too heavy a crop, as this will trigger the cycle. The easiest way to prevent over-cropping is to thin the fruitlets at the start of June after the blossom is over - thin each cluster to one fruitlet per cluster, and then if necessary remove some of the remaining ones as well. Fortune ripens earlier than Cox but for the best flavour leave it on the tree until the apples start to fall before picking. Laxton's Fortune performs well in hotter climates, so is a good choice if you want a traditional English-style apple but are living in Spain, Italy, or southern France. Developed at the start of the 20th century by the famous Laxton Brothers Nursery in Bedfordshire. Laxton's Fortune (often known simply as Fortune) is a cross between Cox's Orange Pippin and a little-known American variety called Wealthy. It received a first class certificate from the RHS in 1948. This was not the first time that the Laxton Brothers Nursery had worked with Cox's Orange Pippin - they had previously released Laxton's Superb, another Cox-derived variety.